iLandscape recognizes that parking at the facility has its challenges. 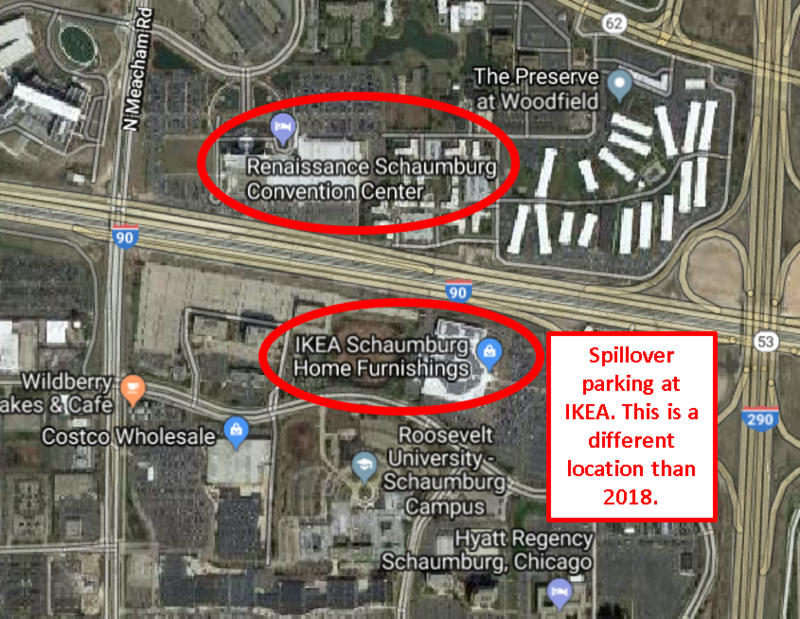 To rectify the situation we have added a spillover lot at IKEA that will be running 5 concurrent shuttles on each morning of the show. There will be no waiting or lines for shuttles in 2019. iLandscape and the Renaissance Schaumburg Convention Center are committed to making your iLandscape experience pleasant from the moment you park your car. PARKING IS FREE at the onsite and spillover lots! Get there early – it is best to park closest to the convention center as opposed to the hotel. Guests of the hotel are guaranteed onsite parking spaces. Parking is free onsite but there are limited number of spaces. Should it be required, offsite parking for this event will be located at IKEA, only 1.2 miles from the Renaissance. Signage from the convention to this parking area will be in place should directional assistance be required. Shuttles will be available to transport attendees to and from the convention center. From the north, take 294 South to I-90W, take the IL-53 exit toward NW Suburbs, turn right onto IL-62 W/Algonquin Rd, turn left onto N Meacham Rd, turn left onto Thoreau Dr. Destination will be on the right. From the northwest, take I-90E, to the IL-53 exit toward NW Suburbs, turn right onto IL-62 W/Algonquin Rd, turn left onto N Meacham Rd, turn left onto Thoreau Dr. Destination will be on the right. From the west, I-88 E, to I-355 N toward NW Suburbs, merge onto I-290 W towards Rockford, exit onto Higgins Rd/IL-72, exit 1B towards IL-58/Golf Rd/Woodfield Rd, turn left onto IL-72 W/Higgins, then right onto N Meacham Rd, turn right onto Thoreau Dr. Destination will be on the right. From the south, I-355 N/Veterans Memorial Tollway, to I-290 W exit towards Rockford, exit onto Higgins Rd./IL-72, exit 1B towards IL 58/Golf Rd./Woodfield Rd, turn left onto IL-72 W/Higgins, then right onto N Meacham Rd, turn right onto Thoreau Dr. Destination will be on the right. From Chicago, Merge onto I-90 W/I-94 W/Kennedy Expy W. Continue to take I-90 W/Jane Addams Memorial Tollway W. toward Rockford/I-294 N/Milwaukee. Take the IL-53 exit toward NW Suburbs, turn right onto IL-62 W/Algonquin Rd, turn left onto N Meacham Rd, turn left onto Thoreau Dr. Destination will be on the right. Alternative entrance during periods of high congestion on Meacham Road: Drivers can access Thoreau Dr. from either eastbound or westbound IL-62/Algonquin Rd.